How many times have you judged someone, by how they look on the outside? Discounted others or even yourself because of some perceived flaw? 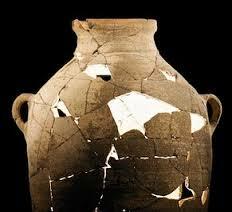 Although, chipped and cracked jars of clay, we carry wonderful treasure inside of us. God has chosen us, as carriers of his treasure. It is those cracks that allow the glow of God’s glory light to shine. Valuable! No matter how broken, God values you. Man looks on the outside, but God looks at the heart. Treasured vessel, lit with his life and surrounded and immersed in his love! We are here for the glory of God, who transforms us.! Let the light shine! Thank you1 Blessings! You bring light to my life, God! Transformed! to God be the glory now and forever and ever! Hallelujah! Everyone who sees the light of God in the pots glorify God! You are most welcome. Blessings to you too. Treasure in earthen vessels. May your light shine forth in me Lord!